This colorful salad is loaded with your favorite winter superfoods. Move over, boring salads. This colorful version is loaded with your favorite winter superfoods. 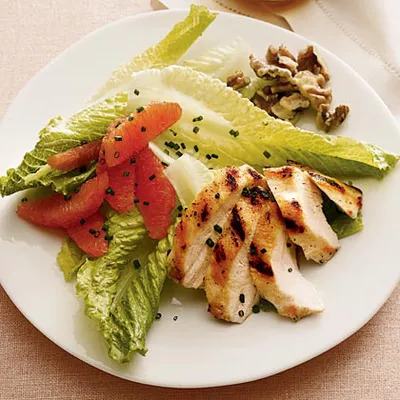 Crispy romaine lettuce is topped with grilled chicken and walnuts, giving you 25 grams of protein, which helps keep you feeling fuller for longer and builds and repairs muscle tissue. Navel or blood oranges add a light zest and sweetness to the salad. Plus, they're rich in vitamin C, which can strengthen your immune system. A light dressing of red wine vinegar, olive oil, and orange juice makes for a refreshing finish to this 244-calorie salad recipe.